The US has sent 400 additional troops to Syria to support an allied local force aiming to capture the so-called Islamic State stronghold of Raqqa. They include Marines, who arrived in the past few days. US special forces are already in Syria. Meanwhile, US-led coalition air strikes killed 20 civilians - including children - near the city, reports say. US Secretary of State Rex Tillerson is to host talks with coalition members ahead of an expected assault on Raqqa. Foreign ministers and senior officials from 68 nations and international organisations had been invited to attend a two-day gathering in Washington beginning on 22 March, the state department said. "Secretary Tillerson has been crystal clear that defeating Isis (IS) is the state department's top priority in the Middle East," acting state department spokesman Mark Toner said. Defence officials told the Washington Post that a Marine artillery unit had been deployed with large field guns that can fire 155mm shells about 32km (20 miles). A coalition spokesman, Col John Dorrian, told Reuters news agency they would help "expedite the defeat" of IS in Raqqa. Over the weekend, a separate force of elite US Army Rangers was also deployed near a town north-west of Raqqa in heavily-armoured vehicles. 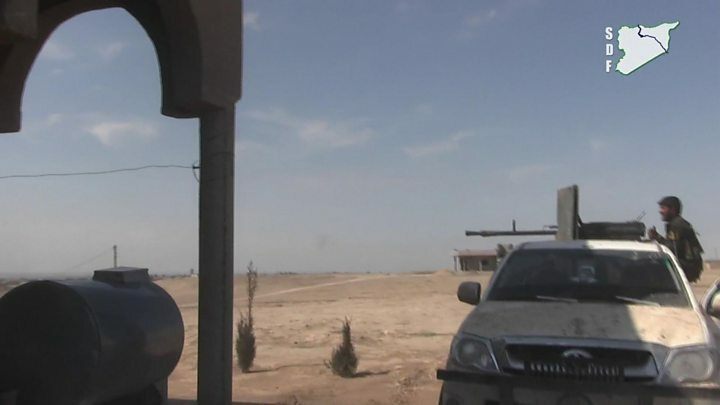 The move was an attempt to end clashes between units from the Kurdish-Arab alliance, known as the Syrian Democratic Forces (SDF), and Turkish-backed rebels. Why are Marines being sent now? IS can be defeated in this war only if its militants are forced to stand and fight as a conventional army, the BBC's Paul Danahar writes from Washington. Much of its senior military leadership is made up of former Iraqi army commanders from the Saddam Hussein era. Their instinct the last time they faced a defeat on the battlefield, during the US-led invasion in 2003, was to melt away. They re-emerged as the leaders of militants opposing the US occupation who then joined to form an umbrella grouping which became al-Qaeda in Iraq. After the start of the Syrian civil war this morphed into IS. What the US Marines will hope to do, working alongside US special forces, is create a net tight enough to kill or capture these men before they get away. That means co-ordinating the assault and making sure the anti-IS forces work together. They will hope to finally force the men that the US military has been fighting for more than a decade into a last stand. How many US troops are there in Syria? Under President Barack Obama, US special operations forces were deployed to recruit, train and advise the SDF's 30,000 Arab and Kurdish fighters. However, their numbers were limited to 503. 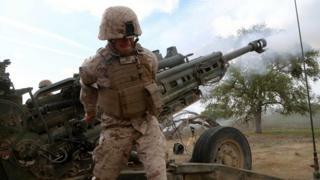 The latest deployment of Marines is considered temporary, so it is not affected by the cap. Col Dorrian said the dozens of US Army Rangers who had arrived on the outskirts of Manbij, about 110km (68 miles) from Raqqa, were also there "for a temporary period". The Rangers were seeking to "create some assurance", Col Dorrian added, following clashes between Turkish-backed Arab rebels and local fighters from the Manbij Military Council, which was set up by the SDF when it captured the town. The Turkish government considers the Kurdish Popular Protection Units (YPG) militia, which dominates the SDF, a terrorist group because of its links to the Kurdistan Workers Party (PKK), which is banned in Turkey. Does this signal an escalation in US involvement? It is not yet clear but the deployment comes as President Donald Trump considers a new plan to defeat IS that was submitted by the Pentagon late last month. The Associated Press news agency reports that Mr Trump wants to give the Pentagon greater flexibility to make routine combat decisions in the fight against IS. Commanders on the ground were frustrated by what they considered micromanagement by the Obama administration, it adds. The US is also said to be preparing to send up to 1,000 troops to Kuwait to serve as a reserve force that can be deployed to fight IS in Syria and Iraq if necessary. How is the campaign to capture Raqqa going? Col Dorrian said the SDF's operation to encircle the city was going "very, very well" and might be completed in a few weeks. "Then the decision to move in can be made," he added. Image caption A US-led coalition spokesman said the SDF's campaign to isolate Raqqa was going "very well"
Earlier this week, the SDF cut the main supply route connecting Raqqa to IS-held territory to the south-east in Deir al-Zour province. The New York Times meanwhile cited US officials as saying there were an estimated 3,000 to 4,000 militants inside Raqqa.